Smooth 36 gauge copper foil. Cut to size with a scissors and attach foil to project with #388 escutcheon pins. 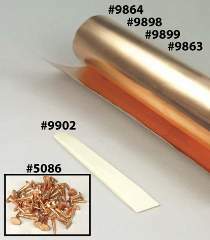 This copper foil can also be used for embossing, punching, rubbing and decorating. The plastic spatula is perfect for flattening hems and forming the copper foil around the edges of the roof pieces of your outdoor projects.